2 Stage Heating with Variable Speed Motor. Like having 2 furnaces in 1, operating at only 60% capacity on stage 1. When left in fan "on", blower runs low and slow at about 30%. Helps circulate air to break-up hot and cold spots, as well as, continuously filters airflow. Most popular style, can work with 1 or 2 stage air conditioning. 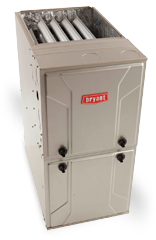 10 year parts warranty, 20 year/lifetime heat exchanger warranty, 1 year labor warranty. 15-40% Savings in gas based on client circumstances. Upwards of $ 200.00 in Nicor Instant Rebates. Upwards of $ 200.00 in Peoples or North Shore Gas Instant Rebates. Upwards of $ 150.00 in Tax Credits, check with your accountant for details. 1 Stage Heating with High Efficiency Motor. Motor converts AC electricity to DC for reduced operation cost. Fully insulated cabinet for quieter operation. Less components to go wrong. 1 Stage Heating with Standard Efficiency Motor. Cheapest upfront cost and to maintain.